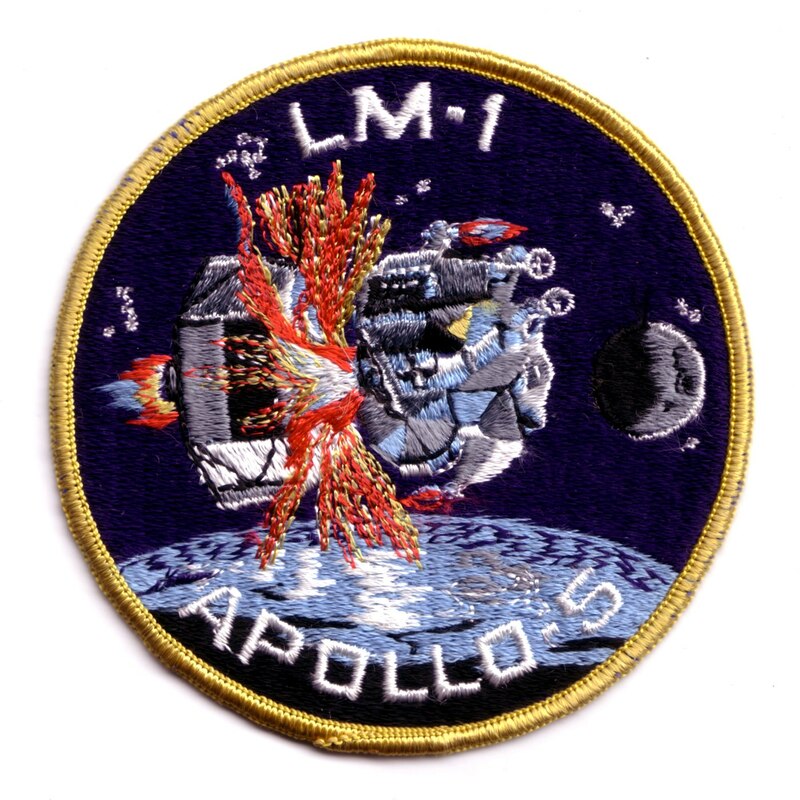 Apollo 5 LM-1 mission patch. 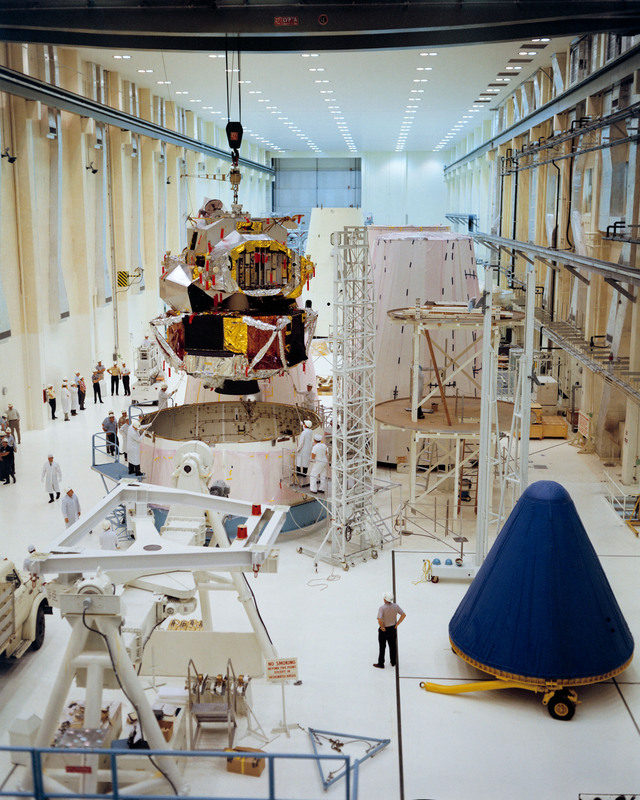 Lunar Module-1 during preflight integration into the Spacecraft Lunar Module Adaptor at Kennedy Space Center. 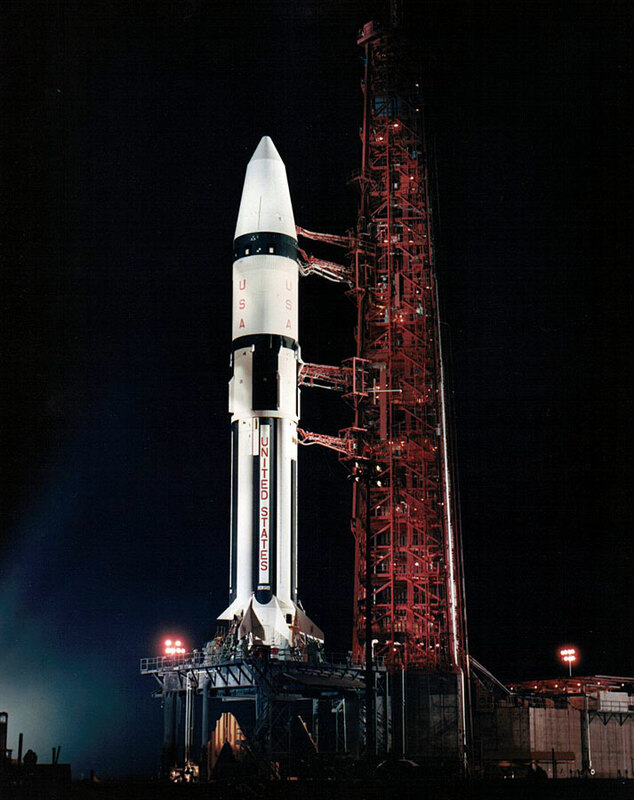 The Apollo 5 Saturn 1B on Pad 37B. The pre-sunset lift-off of Apollo 5 on a Saturn 1B rocket from Pad 37B. 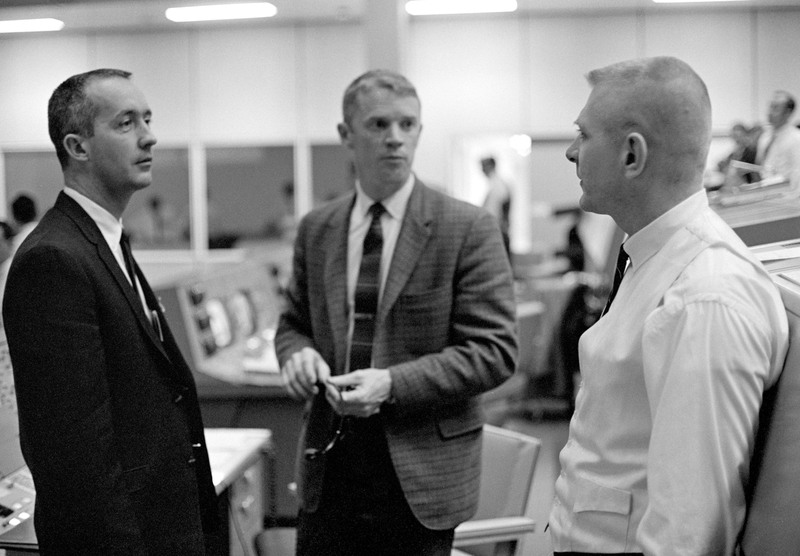 In the Mission Control Center in Houston, Apollo 5 Flight Director Gene Kranz (right) talks with James McDivitt (left) and Russell Schweickart (middle), who were selected to conduct the first manned flight of the Lunar Module. Lunar Module (LM), built by the Grumman Corporation in Bethpage, NY, was the vehicle that would take two astronauts down to the lunar surface and return them to the waiting Command Module in lunar orbit. Before NASA could declare the LM safe for astronauts to fly, however, it had to be tested in Earth orbit without a crew. Grumman delivered the first flight unit, LM-1, to the Kennedy Space Center in June 1967 where workers stacked it on its booster in November. As a weight-saving measure, and because it was not planned to land anywhere, this spacecraft didn’t carry any landing legs. 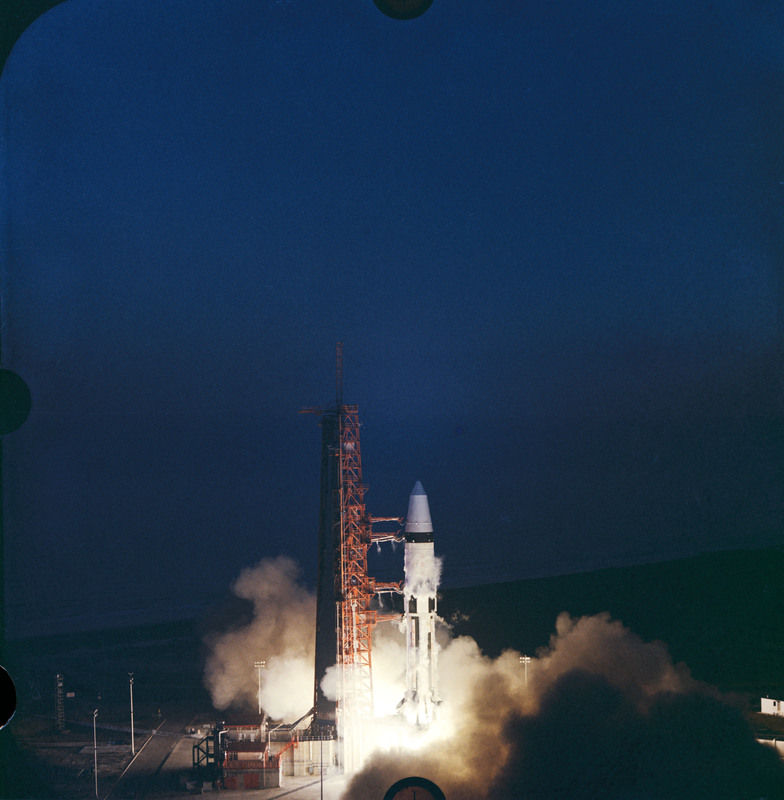 During the flight of Apollo 5, LM-1 would simulate the steps of a lunar landing mission, testing the engines of both the descent stage, used to land the crew on the Moon, and the ascent stage, used to return them back into lunar orbit. Since the LM was not designed to return to Earth, both stages burned up in the atmosphere upon reentry. After the highly successful test of the LM during Apollo 5, NASA announced on March 19 that a second unmanned test would not be required. * The next time a LM would fly in space, it would carry astronauts. The Saturn 1B was deemed so reliable that its next launch would carry a crew to test the Apollo Command and Service Module in Earth orbit. This was the first significant change to the Apollo Program plan that NASA announced in November 1967 and brought the Agency one step closer to a Moon landing before the end of the decade. For many Americans, the Apollo 5 mission was overshadowed by two major breaking news events unfolding halfway around the world. The day the Apollo 5 mission ended, North Korea seized the USS Pueblo and its crew and held them captive for 11 months. They released the crew in December, as Apollo 8 was nearing the Moon. A week after Apollo 5, Americans were shocked by the ferocity of the Tet Offensive in Vietnam, signaling an unwelcome escalation of that conflict. The two events inaugurated a turbulent 1968. *The LM from that would-be mission, LM-2, is on display at the Smithsonian’s Air and Space Museum in Washington, DC.